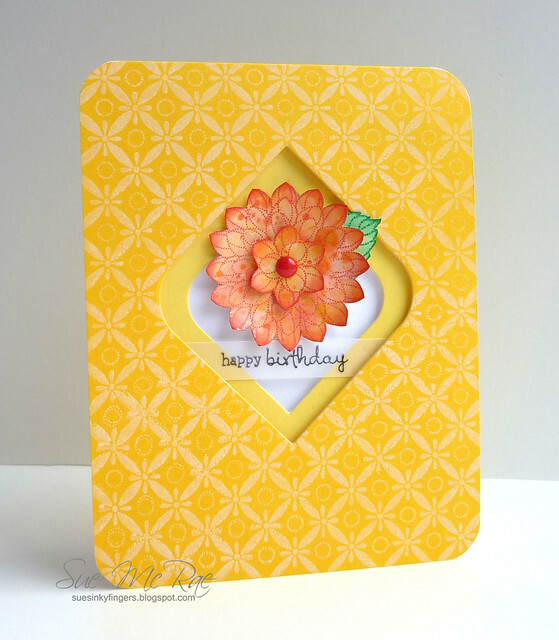 I'm here today with a birthday window card using a dahlia stamp from Penny Black. I finally got my hands on some Distress Paint so I coloured white card stock with Spun Sugar, Barn Door and Mustard Seed and stamped the Dahlia image on top and cut it out. Love how summery these colours are. I definitely want to play some more with these paints. Thanks for stopping by today. I appreciate each and every comment left on my blog. YUM!! Geeez, that's a pretty card, Sue! Gorgeous colors and love the window design! I love everything about that card! Colors are great, stamps perfect, and an awesome window treatment! This is so beautiful! Love that die cut! Think that needs to be added onto my wishlist. Really love the simplicity of this card! Beautiful card, Sue! I love those rounded diamond dies - such a pretty shape. Also love the colors of the dahlia. A really pretty card Sue! Love the colour combo. Gorgeous Sue, saw this tweet and came to see, so glad I did!! Absolutely beautiful!! Just love the die cut window..what a super effect! Its such a gorgeous card ..just love the colors !! Wow.... a beautiful card! Love the layers/colors! Beautifully done!! Love the sunny colours! Very Impressive and stunning! Love the colors, simplicity of the design!